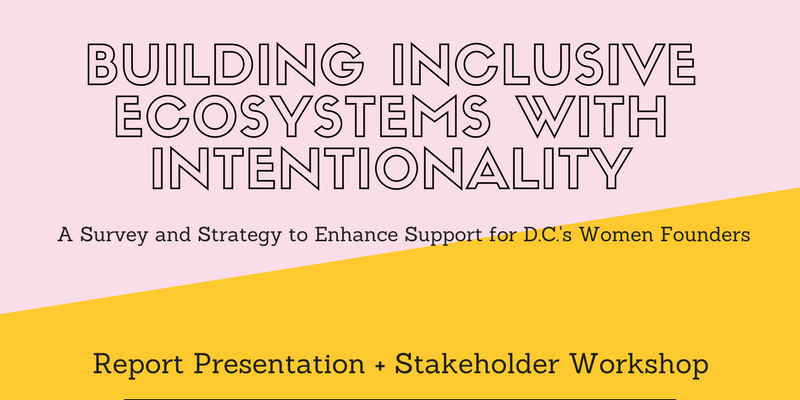 Join BEACON: The D.C. Women Founders Initiative and DICE Leadership Group for an interactive presentation and stakeholder workshop on designing inclusive ecosystems for D.C.'s women founders. BEACON's Inclusive Innovation Fellow, Deloris Wilson, will present findings on D.C.'s entrepreneurial ecosystem and offer a series of recommendations to enhance support for women and minority entrepreneurs. Following a series of interviews and eight focus groups conducted over a six month period, the report's findings will highlight existing best practices and offer recommendations for improved stakeholder coordination, engagement, and on-ramps of support for women and minority founders. Breakout sessions will follow the 45-minute presentation to allow attendees to brainstorm, mobilize and plan next steps in response to report recommendations. BEACON board members have pre-selected campaigns based on the report's findings and request community input, feedback, and buy-in in the design and implementation of selected activations. Join us for this collaborative and engaging discussion. Lunch will be served.